The flavonoids are a large group of naturally occurring phenylchromones found in fruits, vegetables, grains, bark, roots, stems, flowers, tea, and wine. Up to several hundred milligrams are consumed daily in the average Western diet. Only limited information is available on the absorption, distribution, metabolism, and excretion of these compounds in man. Some compounds are absorbed, however, and measurable plasma concentrations are achieved which could have pharmacological relevance. A variety of in vitro and in vivo experiments have shown that selected flavonoids possess antiallergic, antiinflammatory, antiviral and antioxidant activities. Moreover, acting by several different mechanisms, particular flavonoids can exert significant anticancer activity including anticarcinogenic properties and even a prodifferentiative activity, amongst other modes of action. 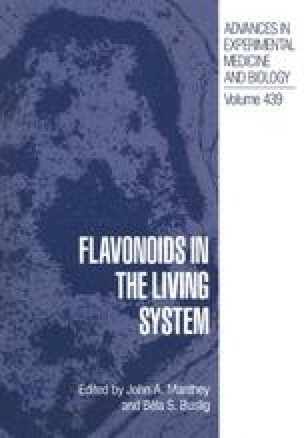 Certain flavonoids possess potent inhibitory activity against a wide array of enzymes, but of particular note is their inhibitory effects on several enzyme systems intimately connected to cell activation processes such as protein kinase C, protein tyrosine kinases, phospholipase A2, and others. Evidence suggests that only activated cells are susceptible to the modulating effects of flavonoids, i.e. cells which are responding to a stimulus. The stimulated activities of numerous cell types, including mast cells, basophils, neutrophils, eosinophils, T & B lymphocytes, macrophages, platelets, smooth muscle, hepatocytes, and others, can be influenced by particular flavonoids. On balance, a considerable body of evidence suggests that plant flavonoids may be healthpromoting, disease-preventing dietary compounds.